It’s not exactly a girl’s bestfriend, but the iNecklace is a wonderful accessory to express a woman’s love for the sciences, engineering, and technology. The iNecklace, a variant of which sports the Apple logo, is a small LED powered aluminum pendant that’s perfect for any particular occasion, be it the workday or evening socials at the computer club. Other than the aluminum pendant, the iNecklace hangs on a diamond-cut curb silver chain. The real attraction of the iNecklace, however, is its open source technology. 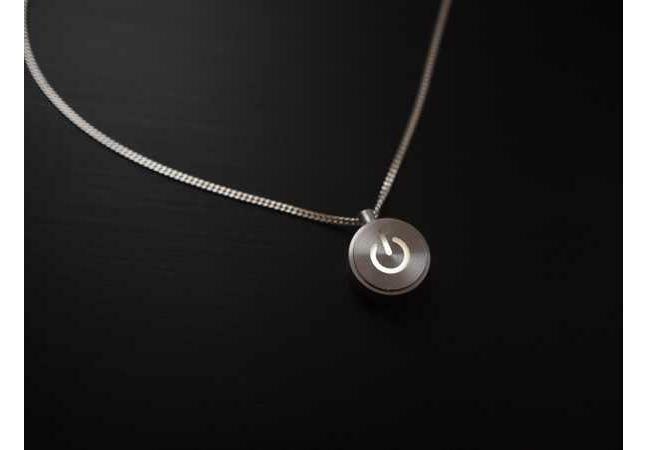 The wearer can legally open up the pendant with a one cent coin and install a miniscule LED bulb. The result? A glowing power button reminiscent of the arc reactor on Tony Stark’s chest. According to the product page, the light pulse is reverse engineered from the ‘breathing LED’ on Apple Macs. Since it’s being promoted as an open source piece of technology, it would be interesting to see what kind of mods are possible with such a small gadget. Maybe a remote power button for your favorite computer? The iNecklace is currently selling for $75. A bargain if you ask us.